(Beyond Pesticides, August 31, 2018) Given the choice to forage on untreated or pesticide-contaminated food sources, bees will increasingly choose the pesticide, according to research published in Proceedings of the Royal Society B in late August. The data indicate that risks to pollinators grow, rather than wane, over time, making improved regulation over bee-toxic neonicotinoid pesticides even more climacteric. In essence, the study indicates that bees may be undertaking the human equivalent of chain-smoking themselves to death. Authors of the study note that numerous studies have been performed that subject bees to neonicotinoid-treated food, however this research generally allows pollinators to only forage on contaminated sources. While this provides important information on hazard criteria, it does not indicate risk of exposure. Positing the idea that pollinators may eventually seek to avoid neonicotinoid-contaminated nectar, researchers provided bumblebee colonies with a choice over the course of 10 days. At the start, the bees exhibited no discernable preference between toxic and nontoxic food. However, as time went on more and more bees fed from nectar laced with thiamethoxam, a widely used neonicotinoid. By the end of the experiment, food containing 2 parts per billion of the pesticide was eaten 10% more than in the beginning of the study. Researchers changed the location of the nectar sources throughout the experiment, but bumblebees still sought out the toxic food. Bees are choosing to seek out and ingest a chemical that has a range of effects on their long-term health and colony success. 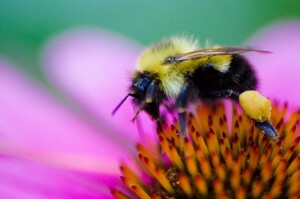 Neonicotinoids have been linked to altered feeding behaviors and reduced egg development in bumblebee queens, as well as the inhibition of pollination skills among bumblebee workers, the loss of bumblebees’ characteristic “buzz” pollination technique, and reductions in overall colony size. Only one other similar study has been conducted, and it found similar results in both honey bees and bumblebees exposed to neonicotinoids. In addition to preferring the pesticide laced nectar, that study found that bees also eat less food overall while doing so. While the European Union recently voted to extend and make permanent a moratorium on neonicotinoids in agriculture, and Canada has proposed a phase-out of the chemicals, the U.S. Environmental Protection Agency (EPA) has effectively taken no significant steps to protect pollinator populations, making only very minor label changes to products that contain bee-killing pesticides. And no further actions have been taken within EPA and the U.S. Department of Agriculture since a 2016 Government Accountability Office report cited those agencies for insufficient steps to protect pollinators. That is why pollinator advocates have looked to the state and local level for protections that other countries like Canada and the EU are currently implementing. Maryland and Connecticut have led the way, and while a similar effort in Massachusetts recently failed to garner unanimous support, campaigners are sure to redouble their efforts in the next session. At the local level, dozens of pollinator policies have been passed in states throughout the country. However, many local laws are at risk in the farm bill, as a dangerous provision would allow the federal government to preempt local jurisdictions even if a state does not have a preemption law on the books. Beyond Pesticides is urging supporters to reach out to Congressional leadership in opposition to the inclusion of this anti-democratic provision in the final farm bill. This entry was posted on Friday, August 31st, 2018 at 12:00 am	and is filed under Chemicals, Increased Vulnerability to Diseases from Chemical Exposure, neonicotinoids, Pollinators. You can follow any responses to this entry through the RSS 2.0 feed. You can skip to the end and leave a response. Pinging is currently not allowed.